Our product range includes a wide range of hardyplast wpc window profile. 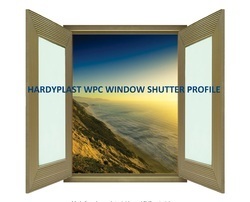 WPC Window frame profiles, a unique development by HARDYPLAST WPC. A ready to fix window shutter profile having 5 mm groove on one side and this can be fixed with 'screw and solvent' mechanism in a couple of minutes!. and your window is ready. You can use it's either of sides e.g. plain finished and line finished. You can polish it or paint it, as per your choice. Carpenter can make and install WPC windows at a supersonic speed now, with this wood replacement product. Packaging Details: Packed in corrugated box of 4 pieces.